Working as a program manager at Microsoft typically means you take a lot of screen shots. Screen shots of web pages, screen shots of application prototypes and (yes) screen shots of screen shots. There are a ton of tools out there that do a number of these functions, some free, some not. My current favorite tool happens to also have my current favorite price. 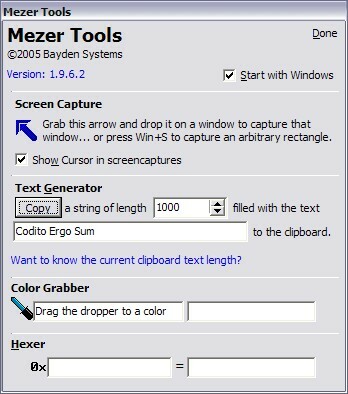 Mezer Tools from Bayden Systems is a free little app with a very appropriate icon: a Swiss Army knife. This great, multi-purpose tool has widgets for measuring linear pixel dimensions and capturing arbitrary rectangles. The dialog box also has additional tools for converting to and from Hex and for grabbing colors from anywhere on the screen. 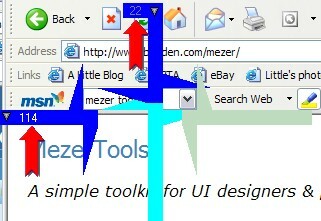 Screenshots (made with Mezer, of course), click for a closer look. Yeah… but the Mezer tool is FREE!